You know, "Renaissance" means "Rebirth." The time-period in history named after it was because it saw a "rebirth" or resurgence of arts, science, and literature. It started in Italy and swept across Europe over the decades. A "Renaissance Man" came to be known as a person who has was well-rounded in their studies, having studied in a variety of areas like the sciences, arts, geography and more. Of course, not all guys were studying anatomy and trying to build flying machines at the time. Plenty of them were getting their hands dirty, whether building stuff, black smithing, or farming. And then you had a scad of explorers, artists, and merchants... yeah. Let's just say there were plenty of things to do. And the best part? They all wore some kind of Renaissance clothes while doing their jobs. That's right. We're talking those pouffy shirts, fancy boots, and clothing we don't even have any more like doublets and corsets. Which were way cooler than t-shirts and jeans. At least, we think so. All those details, and rich colors and fabrics were flattering! Not to mention regal and romantic. Personally, we aspire to such neat outfits, and we think you should too. 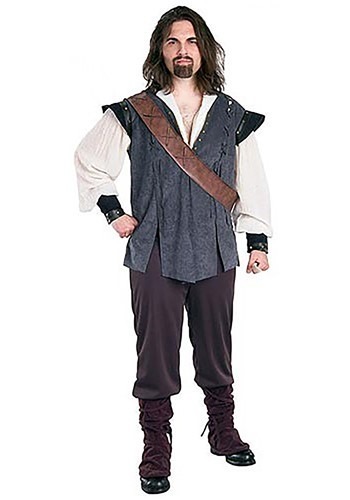 Like this Adult Renaissance Man Costume. It has a grey velour tunic with gauzy cream sleeves. The pants are a dark grey with elastic waistband. There's black velour cuffs and shoulder pads, with a faux leather sash, and boot toppers. You'll look like quite the Renaissance man in this outfit... in more ways than one!